Do women work longer hours than men? When all work – paid and unpaid – is accounted for, women work longer hours than men. This is according to the UN’s The World’s Women 2015 report, which found women spend an average of 30 minutes a day longer than men on paid and unpaid work in developed countries and 50 minutes longer in developing countries. The report, prepared by the Statistics Division of the UN Department for Economic and Social Affairs, presents the latest analysis on the status of women around the world. The 2015 data reveals that women live longer lives, have better access to education and are more independent than in previous years. But despite some significant advances towards gender equality, persistent gaps between men and women remain. The report highlights the importance of achieving gender equality and empowering all women and girls by 2030, outlined in Goal 5 of the UN’s recently adopted Sustainable Development Goals. 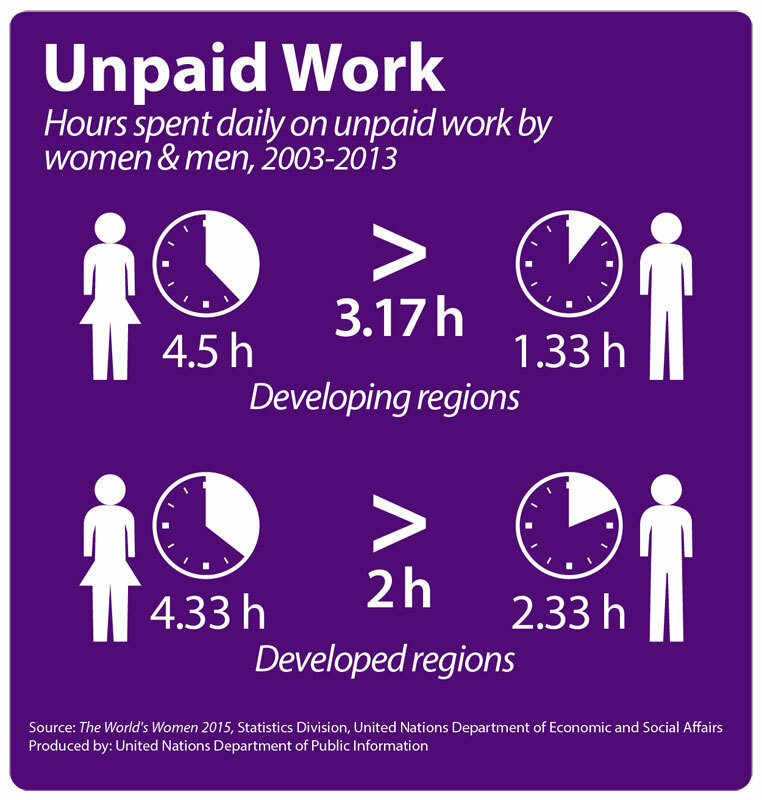 Chapter 4 of the report focuses on women in paid and unpaid work. It points out that women in developing countries typically spend three hours more per day than men on unpaid work such as household chores and caring for children and elderly relatives, and two hours more than men in developed countries. Overall, the difference in hours that men and women spend on domestic work has decreased over time, mainly because women are spending less time on household chores, and, to a lesser extent, because men are doing more childcare. 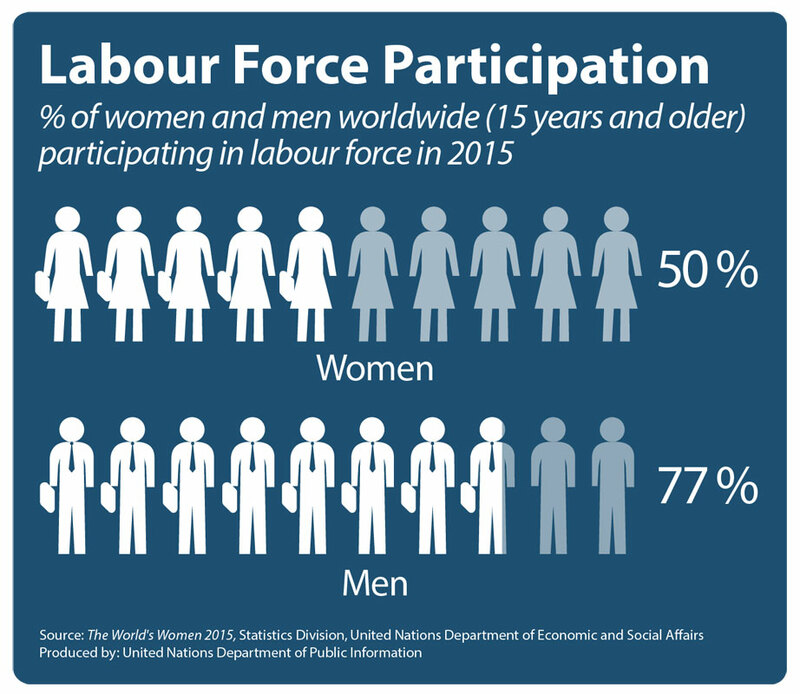 Only half of women of working age are in the global labour force, compared to 77% of men. The gender gap in the labour force is especially large in Northern Africa, Western Asia and Southern Asia, the report said. Women are more likely to be unemployed, in part-time and low-paying jobs, or to be working for their families, which is typically unpaid. In Oceania, sub-Saharan Africa and Southern Asia between 30 and 55% of employed women are “contributing family workers”, about 20 percentage points higher than men in the same regions. The report argues that while part-time work can help women to better balance work, household and childrearing responsibilities, part-time jobs tend to have lower hourly wages, less job security and less training and promotion opportunities than full-time employment. Women are also significantly underrepresented in decision-making positions such as legislators, senior officials and managers, but are overrepresented as domestic workers, positions that are characterised by low pay, long hours and lack of social protection. Across all sectors and occupations, women on average earn less than men; in most countries, women in full-time jobs earn between 70 and 90% of what men earn. Many developed countries show a long-term decline in the gender pay gap, but the trend is mixed in recent years, the report found. The number of countries adopting maternity and paternity benefits has increased over the past 20 years. Over half of all countries currently offer at least 14 weeks of maternity leave and 48% of countries have paternity leave legislation. These measures, however, often exclude workers such as paid domestic workers, those working for their families, casual and temporary workers and agricultural workers. Author: Rosamond Hutt is a Senior Producer at Formative Content.